We show that edge stresses introduce intrinsic ripples in freestanding graphene sheets even in the absence of any thermal effects. Compressive edge stresses along zigzag and armchair edges of the sheet cause out-of-plane warping to attain several degenerate mode shapes. Based on elastic plate theory, we identify scaling laws for the amplitude and penetration depth of edge ripples as a function of wavelength. We also demonstrate that edge stresses can lead to twisting and scrolling of nanoribbons as seen in experiments. Our results underscore the importance of accounting for edge stresses in thermal theories and electronic structure calculations for freestanding graphene sheets. 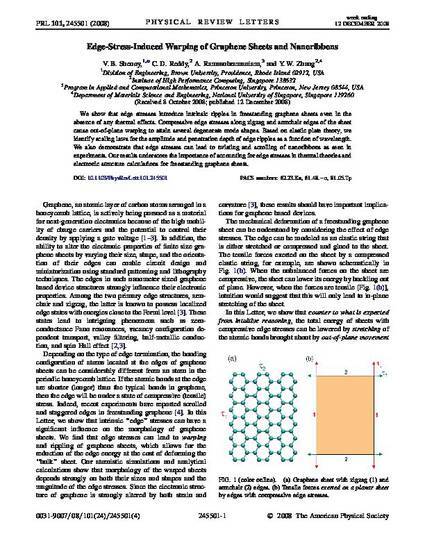 Doi:10.1103/PhysRevLett.101.245501 Copyright 2008 by the American Physical Society.